I’ve been looking for a great chocolate ice cream recipe for quite a while. 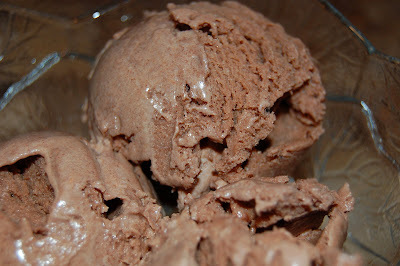 I’ve tried several recipes and made up several, but I finally discovered a perfectly chocolatey, smooth ice cream. It’s easy and has only three ingredients. Here’s what you’ll need to make one Cuisinart counter-top freezer full. If you are making the ice cream in a traditional freezer that uses salt and ice, you’ll need to double this recipe and you can probably add even more half & half. Experiment to see what works (and then let me know too!). 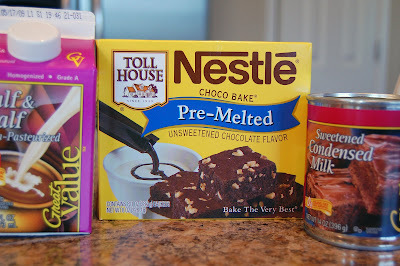 First stir the sweetened condensed milk and the pre-melted chocolate together. Stir in the 1/2 and 1/2. Freeze according to your freezer’s directions. I like to transfer the ice cream into another container and place it in a regular freezer or deep freeze so that it scoops out like hard ice cream. Now that I have this chocolate base, the possibilities are endless for ice cream flavors. And just in case you missed them the first time, I also have Coconut Macadamia Ice Cream and Dulce de Leche Ice Cream. That sounds so easy and only takes a few items. My kids will love it! I was planning on cutting out most carbs but I think I may wait a bit! Oh Yummy It’s about ice cream season again. I love using our ice cream maker. I will definitly make note of this recipe. Ooh, indulgent. I’ll keep this in mind for a chocolate fix once the Easter eggs are gone! You awe me.. where do find the time and ideas?! I want to be YOU! Oh wow, that looks delicious. I think some almonds would make a great addition to that scoop! This is perfect! So, you don’t have to cook it at all? All of the recipes that came with my Cuisinart require cooking a base first, then cooling and freezing. This sounds a lot quicker and easier. Kimm – I’ve never even made the recipes that came with the machine because cooking, cooling and freezing is just too many steps. I refuse to cook ice cream. Mrs. Jelly Belly – almonds would be great in this. I’m so excited to have an easy, tasty chocolate base. The possibilities are endless and I’m sure you’ll see some of them here before the summer is out. DiPaola Momma – Thanks for the compliment! That was fun to read! That is so cool you made your own ice cream!